For seekers of the LOUD sounds, we present eppy-sode 52 of RadiOblivion. Turn it all the way up and have yer life changed by Rock 'N' Roll. Find out just why we scream "Blow Yer Radio Up, Baby!!" Includes such top hit makers as: The Fast Takers, from Oregon; Theee Bat, from New York or Japan (depending on where you look); New Bomb Turks - in celebration of Erik Davidson's new book, We Never Learn: The Gunk Punk Undergut, 1988-2001 (stay tuned for news about that - wooo baby! ); Cyco Sanchez Supergroup, from Germany; and from the U.K., the band everyone is raising a ruckus about, The Parents. From the land of Arizona comes The Okmoniks, followed by Pennsylvania's own Thee Minks - who's page on Music Alley led us to a dead end, link-wise. However, Google saved the day! We've got a couple acts from France - The Magnetix and Attack El Robot! ; one from Alberta Canada - The Gooeys; and one from Illinois - The Goldstars. Though, not necessarily in that order. And let us not forget the world famous Grave Diggers, Phantom Surfers, The Makers, the Count Backwurds, and King Khan & BBQ Show. Warning: may cause spontaneous shimmyin' and a shakin'. 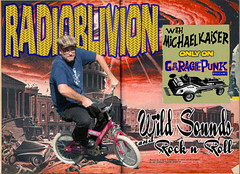 Stop by the RadiOblivion Swag Shoppe on Zazzle fer swell t-shirts n' stickers. Save 10% on orders of $50 or more on any products when you use coupon code WILDSOUNDS10 at checkout. Zooma zooma!